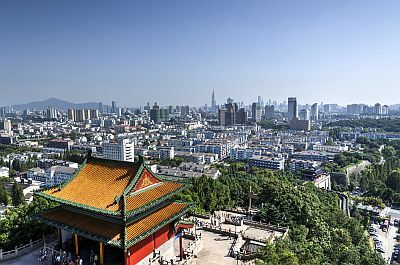 The climate of Nanjing (or Nanking), the capital of the Jiangsu Province and an ancient Chinese capital, is temperate, with cold winters, and hot, muggy and rainy summers. 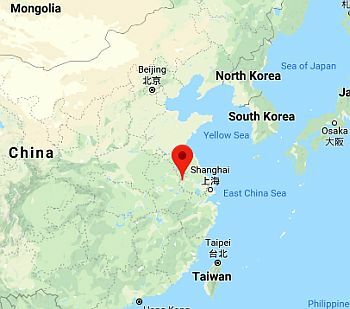 Nanjing is located in eastern China, 205 km (130 mi) away from the sea, and it's crossed by the Yangtze (or Blue River). Rainfall amounts to 1,100 millimeters (43 inches) per year; there is no real dry season, however, autumn and winter are the least rainy seasons, while summer, when the rains occur mainly in the form of showers or thunderstorms, is the rainiest season. Here is the average rainfall. Winter, from December to February, is quite cold: the average January temperature is 3.5 °C (38 °F). There may be very cold periods, with temperatures around freezing even during the day, and with some chance of snow. The temperature dropped to -13 °C (8.5 °F) in January 1977 and to -10 °C (14 °F) in January 2016. In other periods, instead, the temperature becomes mild, around 15 °C (59 °F). At night, fog can form. Spring, from March to May, is initially mild, and becomes gradually warmer. In May, there are already some hot, summer-like days. Spring is a more unstable season than autumn. Summer, from June to September, is hot and muggy. Both the heat island effect of the big city and the humidity make the heat uncomfortable, especially in July and August. June is a wet and cloudy month. Periods of good weather can be sweltering, especially in July and August, with highs around 37/38 °C (99/100 °F) or more and tropical nights. In August 2013, the temperature reached 40 °C (104 °F), and in July 2017, as high as 41 °C (106 °F). Autumn, in October and November, is initially mild, and gradually becomes cooler, and then quite cold at night by November. Rainfall is moderate. In autumn, in the hill called Qixiá shan, you can admire maples showing autumn colors. Nanjing is not a very sunny city; however, the sunniest period (albeit slightly) is from April to August, with the exception of June, which, as we mentioned, is a month when the sky is often cloudy. From time to time, from June to early November, typhoons, the tropical cyclones of Southeast Asia, can affect this area, though less frequently than in southern China. The best times to visit Nanjing are spring and autumn, and in particular, from April to mid-May and from the end of September to the beginning of November. It must be said that spring is rainier, while in autumn, the arrival of a typhoon can not be excluded.